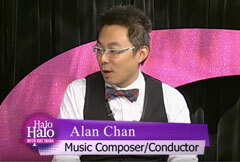 Alan Chan Jazz Orchestra - Shows! With the support of iPalpiti Artists International's first grant for jazz composition! "The four movements of 'Moon Walk'...are full of small and large wonders." Alan Chan and New York-based pipa (Chinese lute) player Min Xiao-Fen team up to explore the possibly of jazz through their new project – "Moon Walk," with inspirations drawn from the story of the goddess of the Moon Chang'e, to Michael Jackson. The seemingly impossible musical journey to the moon through time and space will be presented by a 7-piece ensemble. 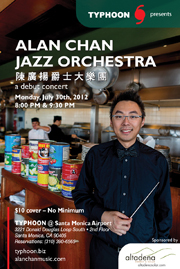 Celebrate the big fat Year of the Pig with award-winning composer Alan Chan and his 17-piece jazz orchestra. 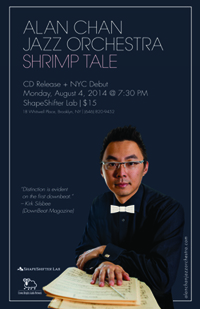 Concert will feature singer-songwriter Ben Thomas and Toonyun, with original pieces and arrangements. Order a baked potato to enjoy with this musical feast! Alan Chan and his 17-piece orchestra is teaming up with singer-songwriters Toonyun and Ben Thomas for a night of great music, combining delicate sonorities with intriguing stories. Alan Chan and New York-based pipa (Chinese lute) player Min Xiao-Fen team up to explore the possibly of jazz through their new project – "Moon Walk," with inspirations drawn from the story of the goddess of the Moon Chang'e, to Michael Jackson. The seemingly impossible musical journey to the moon through time and space will be presented together with the 17-piece jazz big band. Come celebrate the Year of the Dog with the 17-piece ACJO at the world-renowned Baked Potato. "Explore the Sound of Big Band & China"
(two sets) Celebrating the Year of the Horse!! "Rancho Calaveras" - a Musical Farm! 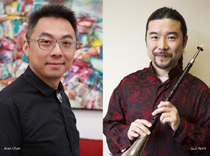 8 & 9:30 pm ACJO - A Chinese New Year Celebration!! 12.21.2012, 10 pm Alan Chan Jazz Septet "Winter News"